Today we will continue the Training Camp Chronicles series by taking a look at days seven and eight. The Vikings offense had its worst practice of the season, but rebounded nicely in the afternoon practice today. Not without some motivation from the coaches to push the players along. After a dismal practice on Monday, the coaching staff supposedly "lit up" the players, per 1500ESPN.com's Tom Pelissero. This proved to work well in many ways as the offensive improved dramatically at Tuesday's afternoon practice. Monday was probably the worst day of camp for the Vikings offense, since camp has begun. The defense controlled short-yardage, and goal line situations, along with 5 no huddle series stops. It wasn't only the first team offense, the second and third team defenses could not execute as well. The first team offense could not yield any success at all and went three and out on every drive. The second team offense was stalled as Marvin Mitchell again intercepted Joe Webb. Mitchell continues to show that he deserves a spot as a backup in the linebacking core. Ponder didn't have much help around him as he was sacked two times and was intercepted once by Mistral Raymond. Ponder did finish the day decent from the completion category, as he finished 10 of 17. Primarily, the majority of these passes were of the short variety which made his completion percentage look better on paper. John Carlson began light jogging for the first time since suffering an MCL sprain. Carlson was very lucky he wasn't seriously hurt, when his knee was rolled upon at practice. The coaching staff is indicating that he should be ready for action once again in 1 to 2 weeks. 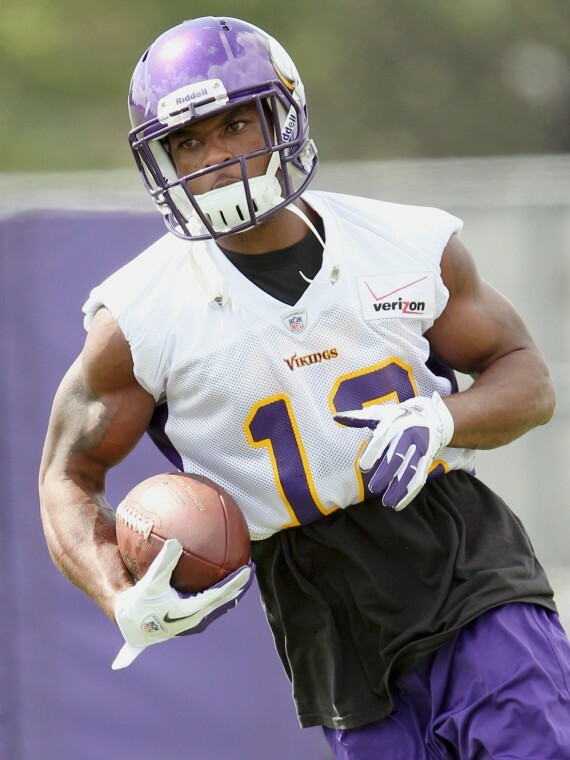 Mike Priefer announced at his press conference on Monday that he would be rotating the punt returns between Marcus Sherels, Jarius Wright, Bryan Walters, and Josh Robinson. In addition, Stephen Burton will get a chance at kickoff returns during the first preseason game. Christian Ponder and the offense had their best practice that I have witnessed since they have arrived in Mankato. Ponder led the team on a great drive in the two minute drills, that was capped by a nice 25 yard touchdown by Percy Harvin. Harvin was motivated after catching the pass and pumped his fist after a successful drive. Ponder's completion percentage took a slight dive to 8 of 17, but he wasn't sacked, and didn't turn over the ball, which is more important than completions right now. Josh Robinson was held out of practice today, as his hamstring became tight once again. Coach Frazier said they would evaluate Robinson tomorrow and would possibly hold him out of Friday's preseason game in San Francisco. Running back Jordan Todman made a comeback at Monday's practice, but suffered a setback. Coach Frazier has already announced he will miss Friday's game, in hopes to have him ready for the next preseason game a week from this Friday. For the third straight practice, the Vikings started Harrison Smith alongside Jamarca Sanford. I really like this switch because Smith plays with so much physicality. He shows so much emotion when he steps on the field. It seems like he always ready to make a hit, or is looking to break up a pass in coverage.The defense continues to be strong and will need the offense to step up in game situations. The defense will keep us in the game, we will just need to get the ball in the endzone. Also, the offense needs to kill clock so the defense doesn't have to remain on the field for long periods of time. This has hurt the Vikings down the stretch in past seasons. Overall, the Vikings are making strides and I can't wait to see roster battles begin on Friday in San Francisco.